At this point in our roadtrip, I’m just flabbergasted that we’ve covered so much ground! In just driving from point A (Joburg) to B (Durban) we’ve clocked 7,500 kms and that doesn’t include all the additional driving we’ve done to different sites, or the game drives we’ve done. I’m already both looking forward to and dreading writing up the post for the total trip with our itinerary, costs, etc. It’s going to be a big one! We decided to spend 2 days in Durban to see the city and also get a small break from camping. I chose Glenwood as the neighbourhood to stay in and we got this great little (and cheap!) Airbnb. It was a big day of driving – 7 hours from Coffee Bay and we got unpacked and relaxed for a bit before my stomach was making some seriously crazy noises – we’d skipped lunch to push through the drive and I was ready for dinner! Durban has the highest Indian population outside of India, so we knew what we were doing for dinner. After asking our Airbnb host for a reco, we decided to walk over to Little India. 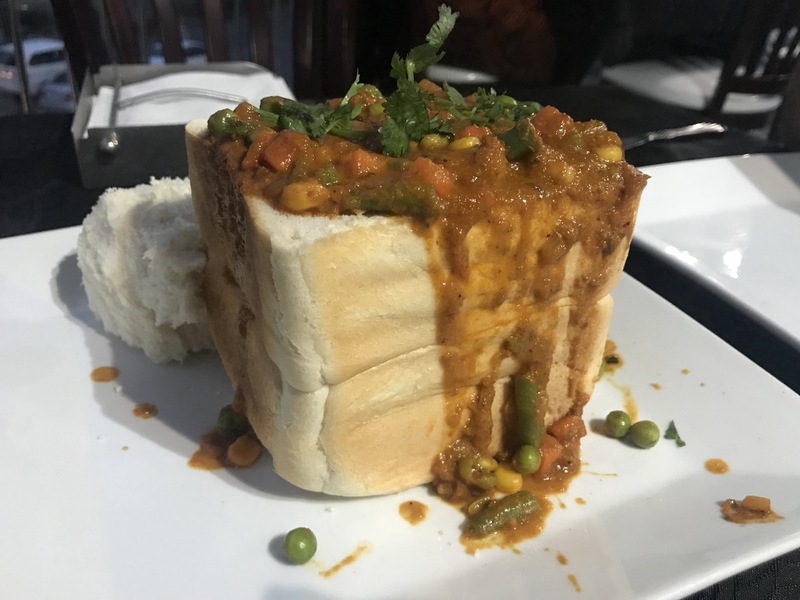 As we perused the menu, we decided we had to order a Bunny Chow – something Durban is known for. Since it was just meant to be a starter (the fish curry was catching my eye and James was jonesin’ for vindaloo) we decided on the ‘Quarter Bunny’ with vegetable curry. It’s basically a loaf of white bread, with the bread scooped out and filled with curry. Basic, but delicious! And the curries (and garlic naan) didn’t disappoint either! We decided the half hour walk back to the Airbnb was necessary as we ate WAY too much! The next morning, we walked over to Glenwood Bakery for breakfast. It was super cute, with old cookbooks everywhere so I (obviously) had to get some pictures! After breakfast we did a self guided walking tour of Glenwood’s finest graffiti. Not only did we see some awesome graffiti, we also stumbled upon some great places like the KwaZulu-Natal Society for the Arts (KZNSA) where I found the adorable and hilarious book (Princess Pincushion) to pick up for my nieces. We headed back to the Airbnb for a few hours and then made our way down to the beach. I had this vision of us renting bikes from Bike & Bean and riding along the promenade, but the weather had other plans. As the sunny skies from the morning turned grey and cloudy I figured the bike ride would stay a dream. Still, we did head over to Bike & Bean to see the beach and I got a delicious Chai Latte. We hopped back into the car and drove over to the Station Drive Precinct; a previous ‘no go zone’ for tourists that is undergoing a massive gentrification. There are lots of artsy little shops and some amazing furniture (‘One day!’ we keep telling ourselves anytime we see a piece that we love). There’s also a distillery and craft brewery, so obviously we had to check both of those out. Distillery 031 was a really cool spot. We arrived just as they were opening at 4pm and decided to share a tasting which included vodka, gin, appertifs (vodka based) and absinthe. Because why the heck not?! The gin was great and the appertifs were delicious – the vanilla one actually tasted like frosting. After our tasting, we decided to get some cocktails – a Gogo’s Ruin for James and a Gin Fizz for me. He definitely won the cocktail decision, because the Gogo’s Ruin was delicious and the rim of the glass was coasted with crushed gingersnaps! After our cocktails, we made our way to That Brewing Company for some dinner (we’d skipped lunch again on account of a late brekky and were starving!). It was November 30th which meant Annual Burger Day. Backstory on that can be found here. The beers and burgers were both great – definitely check this place out if you’re ever in Durban! The next day we were heading to Lesotho via the Sani Pass – a renowned 4X4 track, in our 4X2. Yikes! My nerves were already kicking in when we woke up, but a quick stop by Glenwood Bakery for breakfast (again) helped put them at ease, at least for a little bit. Durban was awesome. We only scratched the surface in the two days (well, really, one day) we were there but we really enjoyed the neighbourhoods we went to – and the food! Do yourself a favour and head to Durban for a Bunny Chow; you won’t regret it! Posted in TravelTagged #africa, #airbnb, #bunnychow, #distillery031, #durban, #glenwood, #glenwoodbakery, #graffiti, #roadtrip, #southafrica, #stationdriveprecint, #thatbrewingco, #visitafricaBookmark the permalink.